I’ve posted most of my pictures thus far from Seattle. They don’t all have titles or tags, and some of them aren’t rotated yet, but they’re up. Login if you want to see all of them, otherwise you’ll just see the lamer, public ones. Typically when you shop at Amazon, they’ll offer you a suggestion of something to buy in addition to what you’re currently buying – sometimes they’ll even give you a discount on the combination. Say you’re looking at a Pearl Jam CD, they might suggest you buy it with another Pearl Jam CD and give you a dollar off the combination. Well, today I was browsing for a bluetooth mouse. This was one of the less expensive ones – coming in around $45. What does Amazon suggest you buy in addition to it? How about a $600 iPaq! That’s definitely a sweet combo it’s tough to refuse… I’m sure you’ll catch a lot of people with that impulse buy. I just wanted a mouse for my laptop, but then realized, why not spend $600 for a handheld PC too! In case you’re looking for me, I’m currently in Seattle. This weekend I’ll be going to the Sasquatch Music Festival which should be a good time. If anything crazy happens, I’ll be sure to post (hopefully with pictures). I didn’t realize there was such a holiday, but apparently I forgot to celebrate no pants day. So it looks like there were no confirmed time travelers at the time-traveler convention yesterday. The question that really blows your mind is – does that mean we should still be advertising? I’m sure the answer is yes, but the difficult part to conceptualize is what the benefit would be to us (individuals living now) since we have already passed that time and no one showed. The only authority we can really turn to on a subject like this is Doc Brown. So, by now everyone has seen Google Maps and by and large find it very impressive. You might even have seen the housing finder that someone built by integrating google maps and craigslist, or that someone developed a mechanism for integrating Flickr with google maps and called it Geobloggers. Cooler still is the fact that Amazon is working on a yellow pages such that you can see pictures of the businesses, and in fact walk down streets and see what’s nearby. This is all pretty cool stuff. What I’d really like to see is someone integrate this mapping/photographic stuff in such a way that it also reflects time. For example – lets fast forward a few years when we all have cameras in our phones, and those cameras are actually decent (multi-megapixel) quality. When we take a picture, not only is the time captured with it (very common these days) but also the GPS co-ordinates (less common these days). You now have an image that looks good, and it is tagged with where on earth it was taken and when. Now you zap this phone off to an online service… like a Mobog of the future. What might we end up with? How cool would it be to be able to browse your city or town and see what was going on at a given instant in time? How about big events like concerts? See the band from multiple angles. See yourself in others’ pictures. Maybe even big world events… like 9/11. We could have thousands of pictures of something like that from numerous angles at various instances in time. Then zoom out and slide over and see what was happening in Los Angeles at that same point in time. I think something like that would be pretty damn cool. I also don’t think we’re that far away from seeing it. This whole idea is pretty hilarious (and awesome). Schedule a time traveler convention, publicize it well, and hope people from the future show up. Can’t the time travelers just hear about it from the attendees, and travel back in time to attend? Yes, they can! In fact, we think this will happen, and the small number of adventurous time travelers who do attend will go back to their “home times” and tell all their friends to come, causing the convention to become a Woodstock-like event that defines humanity forever. Unfortunately, we of the present (2005) don’t have time travel, and so we only have one chance at observing the convention. If the time travelers don’t leave us their secrets, we won’t be able to go back in time and see our convention in all its glory unless it is publicized in advance. This blog is pretty interesting. They post anonymous postcards from people around the world/country. Some of them are really sad. Others are pretty funny. 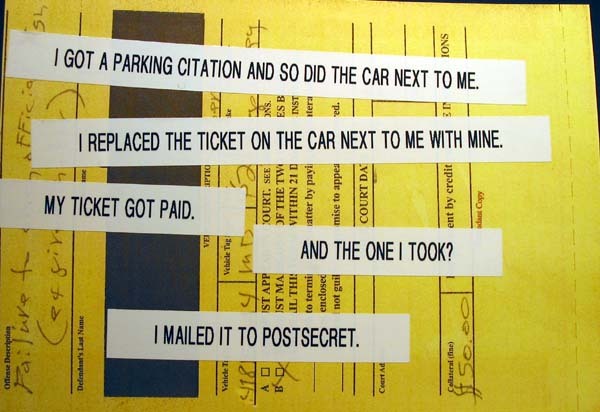 I thought the parking ticket one was great. Check out this post at wackbag.com. It was from a girl who went to the same show we did. In the second picture, down in the lower-left hand corner, you can see my green sleeve next to a Heiniken bottle. Anyhow, today during the radio show they were talking about these pictures a lot – making fun of the smelly girlfriend and the guy picking his nose, etc. That guy was sitting right across from us. Callahan made fun of him at one point, I believe.